You may have noticed I haven’t been good about updating – sorry. A busy spring, combined with the death of my laptop (with all of my work files on it and I hadn’t done a backup since January) set me back a little but I’m back on track more or less (the new website has been delayed again, but isn’t forgotten. I’ll just have to do it in steps until it has everything I want on it) Below is my latest column and I just posted the previous column as well. After a long winter and a slow start to spring, people are anxious to get planting and add some colour to their gardens. The trouble is, at this time of year the weather is a little unpredictable. I still can’t believe it snowed most of the day last Thursday. Some snow overnight or in the morning isn’t that unusual for this time of year, and I wouldn’t be at all surprised to wake up to a white lawn in the coming weeks, but for it to snow in the middle of the afternoon seems a bit out of place. Obviously, there are a number of plants that you should hold off on planting, so the question is; what’s safe to plant? There are a number of annuals that can be put in now to give you some colour. Pansies are the first plant that comes to mind when planting in the spring. They can take the cold, the snow, the frost – pretty much anything you throw at them, except the heat of the summer. Primulas are another bright and cheerful annual that will get you through the coming weeks. They have yellow centres and come in red, yellow, orange, pink, purple, blue and creamy white and many have two colours. Primulas also have the added bonus that if they’re planted in the right spot, preferably sun in the morning and shade in the afternoon , they will usually come back the next year. 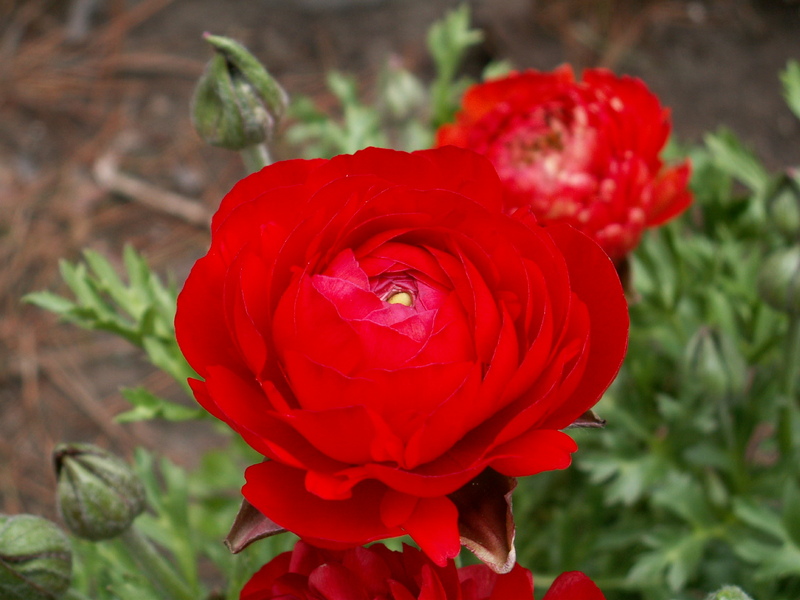 Ranunculus is another favourite of mine. They have these big, bright, delicate-looking flowers that will remind you of old fashioned roses or peonies, yet they’re a lot tougher than you’d think. English daisies will also give you lots of spring colour and will usually come back if given afternoon shade in the summer. One annual that might surprise you with it’s cold tolerance is snapdragons. They’re not put off by an occasional frost, yet will continue to bloom spring through summer and well after the first frost in the fall. There are a number of perennials that can be planted now. Hellebores, or Lenten rose as they’re sometimes called, are early bloomers (usually the first, excluding bulbs) that can take freezing temperatures, let alone frost. As long as they haven’t been grown in a heated greenhouse, they can be planted as soon as you can get into the ground. They have evergreen foliage and in the spring, put up blooms of white, green, yellow, pink, purple and red. Most of the older varieties have nodding flowers, many with wonderful spotted markings inside. Many of the newer varieties have upward and outward facing flowers. After about four to six weeks, the colour fades to a creamy white and will usually stay on the plant, much like a hydrangea. This seems to be more prevalent on the outward facing flowers and I’ve often seen blooms hanging on when I’m wintering plants in November. Coral bells are another perennial that can be planted now. Their leaves come in a huge array of colours including greens, yellows, reds, oranges, purples, and silvers. When looking at trees and shrubs, you can plant them if they’re still dormant and you can usually plant them if they’re just breaking dormancy (leaf buds are starting to appear). I say usually because if a plant has been grown in Niagara and is starting to break dormancy, it might not yet be safe to plant it here. Japanese Maples are a good example. Their foliage is very sensitive to frosts and you could actually have branches die after a hard frost. A good rule of thumb when dealing with new plants that have started to break dormancy is to look at the same plant in your own garden (or a neighbour’s). If it’s been in the ground for the winter and is starting to leaf out, then it’s probably safe to plant a new one. If you’re not sure, you can always hold off on planting. Move it into the garage or onto a covered porch for cold nights. I generally expect a chance of frost if the overnight temperature for Uxbridge (not Toronto) is four degrees or lower. If the temperature is going to be below zero, I’ll usually throw a blanket over the plant as well. An increasingly common trend is to plant up urns and other containers with Primula, English daises, Hellebores, coral bells, and cool season grassses. Then when it’s time to plant your summer annuals, move these plants to your garden to be enjoyed for years to come.